First off, thank to the New Belfry WebComics Index for the great link! And then… As you can see above, this is the frozen 2-D reference I took for the last panel of today’s strip, and I do that for every panel. Which brings me to sending out thanks to Bob Goff. 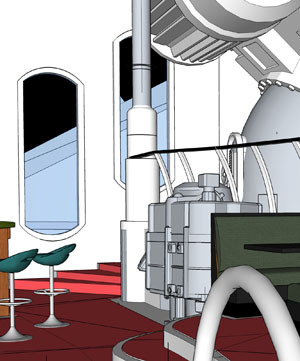 My plan for the main spaceship is to design the entire interior as a 3-D model, and use that as a reference. I hired Matt Nolan (Thanks, Matt!) to turn my spaceship pencils into 3-D hulls, and then with the help of Bob (and some beginning assistance from Nick and Rob) we’ve been fleshing out the entire inside. Bob’s lent his strengths with focusing on the forest (I’m good at trees) as well as the more precision work (I’m still quite amateur at Sketchup). He also designed the Ring-Deck, the center of the ship, a piece of beauty. Thanks, Bob! I put a lot of thought into how to draw Spacetrawler. I chose this 3-D reference method because I feel in a sci-fi story the background plays a very important role, setting the tone and place, so much so that it’s almost as if it’s one of the characters (much in the same way as I’ve used it before). I didn’t want merely a hint of the surroundings, I wanted a solid consistent fleshed out reality, so that you, as the reader, would feel more that you’re there, in the foreignness of it, the isolation, that you could become an astronaut. Interesting. This is the third web comic I follow that uses 3D graphics for background reference. One of the others even uses it for a spaceship, just like you. Neat! One possible downside: you won’t be able to make spaceships that seem bigger on the inside than on the outside. and on a related note, you wouldn’t happen to have modeled Mr. Zorilla’s house, would you? 2. I know Martina likes to try out new things, but how did she know she had to put the helmet on her head? Taking the word head alone, the Spanish word is “cabeza”, and the French word is “tÃªte”: very, very different one from the other. How much happens between pannels 1 and 2 then? 3. Funny that Dimitri is the one who reaches out for the helmet (though it may not be him; I’m judging by skin tone alone, here) when Emily tosses it, given that he has the wrong idea of what it does; or is his English that good that he could deduce what it was for from Emily’s comment alone? I don’t know, but somehow, the explanation that he just wanted to get stone seems more fitting. 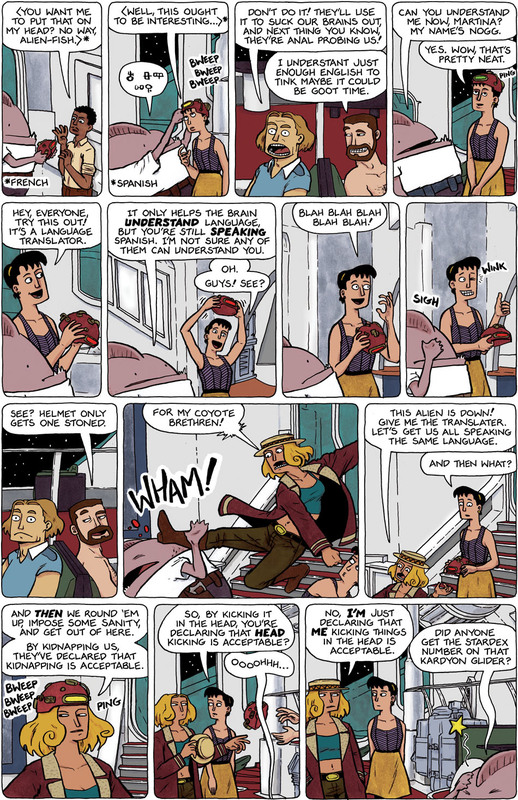 Lastly, and since I’m several days late, great strip! You could probably split it into 4-panel chunks and still have it work. I’m thinking the tendancy to close with a joke every 4th panel is something you’re doing because of your experience with Dee, but I sure hope you don’t “grow” out of it! I did model Zorilla’s house. It’s how I learned the program, actually. 1. Living in the American southwest outback, it is not odd that she has an okay grasp of Spanish. 2. NOGG puts it on her head. She does nothing. 3. It is Dimitri, although I’ll leave you to decide the reason. The motivation for me using him is that he was of least resistance to the idea, and so seemed most logical. By head-kicking a kidnapper, Emily declares that head-kicking kidnappers is acceptable. Kidnapping vs abduction, both are similar but only one asks or demands payment for return. Then a boot to the head!